This kosher recipe for dairy-free (parve) potato kugel made with potatoes, onions, and eggs is a classic. It can be eaten with a meat or dairy meal. Potato kugel, sometimes called potato pudding, is a staple Shabbat and holiday dish in Eastern European (Ashkenazi) Jewish cooking. The best potato kugels are tender on the inside, crispy on the outside, and make the perfect side dish for roast chicken or brisket. 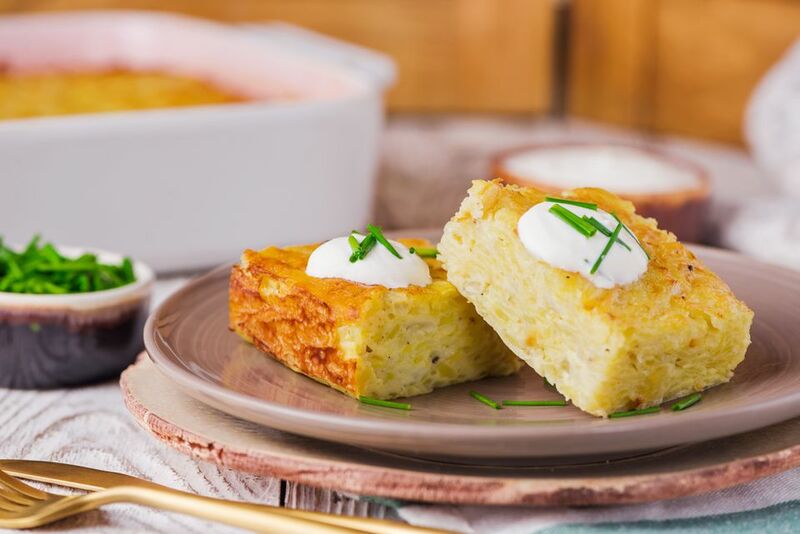 There are lots of delicious variations on the classic potato kugel, some of which include carrots, zucchini, garlic or a host of other vegetables. But for many people, nothing beats a kugel like this one made simply with potatoes, onions, and eggs. Purely vegetarian options are easy too! Heat the oven to 400 F (200 C). Oil a 13- x 9- x 2-inch baking dish. Using a box grater or food processor fitted with a shredding disc, you must coarsely grate the potatoes and onions. Let stand for 3 to 5 minutes, then place in a colander or clean tea towel and squeeze out any excess liquid. In a large bowl, beat together the eggs, oil, flour, salt, and pepper. Set aside. Add the grated potatoes and onions to the egg-flour mixture. Mix with a large spoon just until smooth. Pour the kugel batter into the prepared baking dish and smooth the top with a spatula. Bake the kugel, uncovered, in the heated oven for 1 hour, or until golden brown on top. When the kugel is done, a knife inserted in the center should come out clean. Place the baking dish on a rack to cool slightly before cutting into squares to serve. Serve with a dollop of sour cream and a sprinkle with chives if desired.